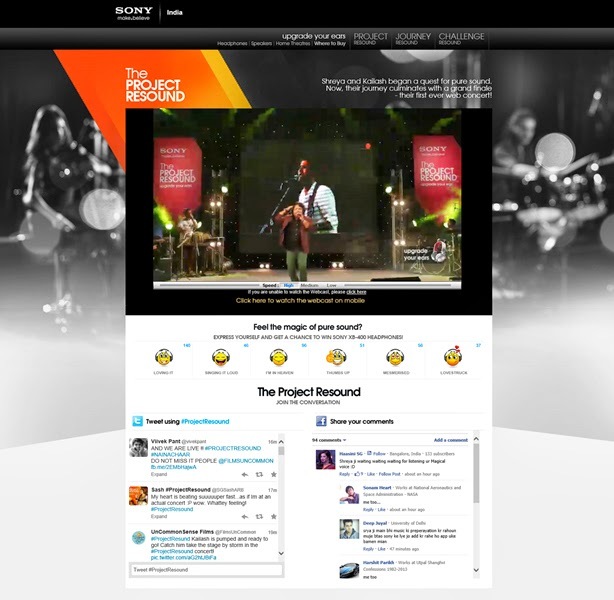 Sony’s Project Resound campaign came to a culmination on 12th September, Thursday with the online steaming of The Resound Web Concert featuring brand ambassadors Shreya Ghoshal and Kailash Kher. The singers belted out a set of their popular hits and unveiled the new single ‘Naina Chaar’ created especially for this campaign. The quality of the stream was amazing. There were options to view the stream on mobile and share feedback. The inevitable social layer got fans to Tweet and post on Facebook directly from the web concert page, adding to the buzz. 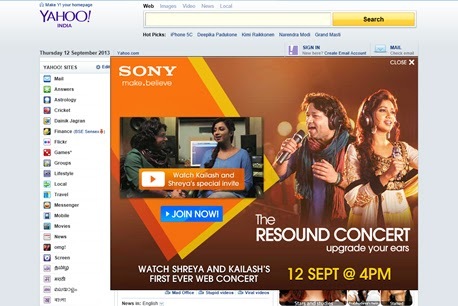 Sony created appointment viewing for the concert through social media posts and video invite from Shreya & Kailash posted on their YouTube Channel. The promotions on Thursday included rich media takeovers on key publishers and Social Media posts. There have been some new additions since I covered the campaign 2 weeks back. The Jukebox application got fans to vote for the concert playlist. The Autograph Booth is another interesting app that uses Facebook connect, gets fans to upload a picture and generates an autographed message from Shreya/ Kailash. This is a great example of a well thought through, cohesive and clutter breaking campaign that leveraged brand ambassadors to create an exclusive experience for fans. Social media, videos, continuous planned updates kept the buzz alive throughout the campaign. Excellent effort!